We’ve already established how much I love Jason’s Deli. Well, this soup is another item they have that I love almost as much as their muffins. When I was searching around for a similar recipe, I wound up finding two. One was made from scratch and kinda high in fat, while the other was uber simple (10 minutes to make it – TOTAL) and low fat. I decided to make both and see how they compared. In end all taste-testers (which would be me and Brandon) agreed that the made from scratch version was better, but the other version was definitely still good and the fact that it was so simple and also low in fat made up for the taste discrepancies. In the end, I’ll be keeping both of these in my recipe arsenal and choose based on how much time I have to make dinner. Both versions were very hearty and filling. I was actually amazed that I could be filled up from soup! I’ve listed peas, carrots and corn, but I’ve also made this with green beans instead of peas. You can put in whatever vegetables you like. And just like Jason’s I put a square of puff pastry on top. So good! *If you want to save some time, I like this pre-cooked chicken. 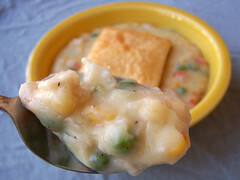 **You can use frozen corn/peas instead of canned. Cook the still frozen vegetables along with the carrots instead of adding them at the end. Put potatoes in a pot with 1 cup of chicken broth and enough water to cover them. At the same time, put your carrots in a pot with enough water to cover them. Cover and cook both vegetables until fork tender, about 15-20 minutes. Meanwhile, heat up 1 teaspoon of oil in a large dutch oven or pot over medium heat. Add half of the cubed chicken to the pan and cook until no longer pink, about 5-10 minutes (depending on how big you cut the pieces of chicken). Transfer the cooked chicken to a plate. Heat the other teaspoon of oil and cook the remaining chicken. Add it to the plate and set aside. If there is any liquid/oil left in the pot, pour it out. Melt 3 tablespoons of butter in the pot. Add the onions and saute over medium heat until soft and translucent, about 5 minutes. Add the remaining 3 tablespoons of butter. Once it melts add the garlic, bouillon, thyme, pepper, flour and 1 cup chicken broth. Stir until smooth. Gradually whisk in the milk. Cook over medium heat until it boils. Simmer, stirring constantly, for a few minutes until it thickens. Note: If the soup gets too thick for your liking, add in more chicken broth. If it’s too thin for your liking, try adding about 1/4 cup more flour or cook it longer to let some liquid evaporate. Stir in the chicken and vegetables. Turn the heat to medium-low and cook, covered, (or uncovered if you want to thicken it more) while you bake the puff pastry. Roll out your pastry dough about 1/4 inch thick and cut into 3×3 inch squares. Bake in 375 degree oven for 7-10 minutes, until puffy and slightly browned on top. Add salt and pepper to the soup, to taste. Serve with puff pastry on top. In large pot, combine all ingredients and heat through, about 10 minutes. Roll out your pastry dough about 1/4 inch thick and cut into 3×3 inch squares. Bake in 375 degree oven for 7-10 minutes, until puffy and slightly browned on top. Serve on top of soup. I just spotted this on Photograzing…. my mouth is watering as I add these ingredients to my grocery list……. this is probably my most favorite thing in the whole wide world….seriously! Wow, this looks incredible! Perfect for a chilly autumn evening. Another topping option is used by our favorite local deli – pie crust crumbles. You can either cut up a frozen roll of prepared pie crust (which makes really cool little curlies when baked) or whir it up in the food processor and spread it on a baking sheet. Bake until lightly brown and cool; then serve on the side. Great recipe! Jason’s Deli! This was exactly what I was looking for! If you are really in a rush, use 3 cups of frozen mixed veggies instead of the three veggies listed in the quick version… just make sure to choose veggies without lima beans! This was delicious and my whole family loved it. 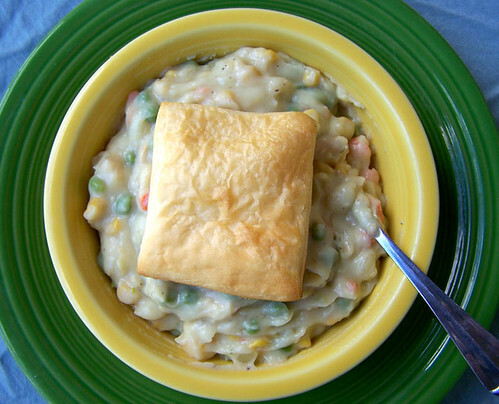 Although, it didn’t taste like Jason’s delis Chicken Pot Pie to us. It was still very good and very easy to make. We followed the “from scratch” recipe. I will definitely be making this again! !